Packed 4 x 52 per Cs. Foreign language, church, band, choir, or general school fundraising has never been so easy by selling candy. Raise money quickly with the #1 selling Fundraising products. The Van Wyk One dollar bar is some of the creamiest finest chocolate available at such a low price. It rivals the German and Swiss chocolates in taste and quality, but beats the foreign candy manufacturers hands down in price. 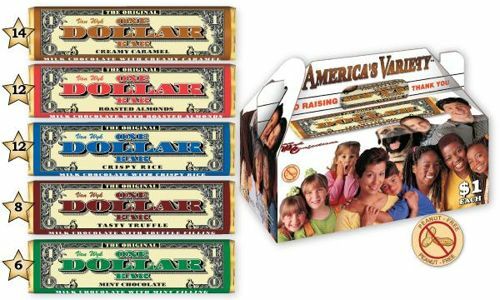 At one dollar each (retail price to your customers) these are a very quick and easy money maker. Your customers will be coming back for more!